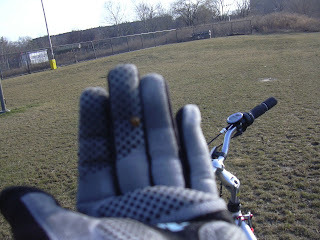 Photo - a yellow lady bug landed on me while I was biking - this is it - on my finger! Monday's tend to be my best day for inspiration and blogging. Funny how that works - I feel more jazzed about writing and reflecting after my Monday Night Weight Watcher's meetings, especially if I've had a good week with a significant weight loss. This week's meeting was fine - I didn't gain back any of my lost 50 pounds, and I inched down another .2 pounds. I don't think I'll loose my next 10 pounds easily if I continue to eat birthday cakes, go out drinking and not ride or exercise. I've allowed myself to be content with staying in the same general spot. What has jazzed me up today is that I got a most excellent bill of health from my doctor. I had blood work taken two weeks ago and the results were glowing! My blood pressure is down and under control; my cholesterol and triglycerides are low low low, and best of all - I did not have to take any medication to get the lower the numbers! The positive results have all come from the hard work, positive efforts and determination I've put forth. I actually feel happier tonight about my doctor's appointment than I did last week when I hit the 5-0 mark. It's receiving this validation that makes it seem more significant and important. Now I know that I can achieve my next set of goals. This week I plan to check out a few gyms in the area so I can start my triathlon and bike ride trainings. I'm starting to make plans for several other bike rides this spring and summer. Whatever has shifted within me feels right. Moving forward never felt so good!